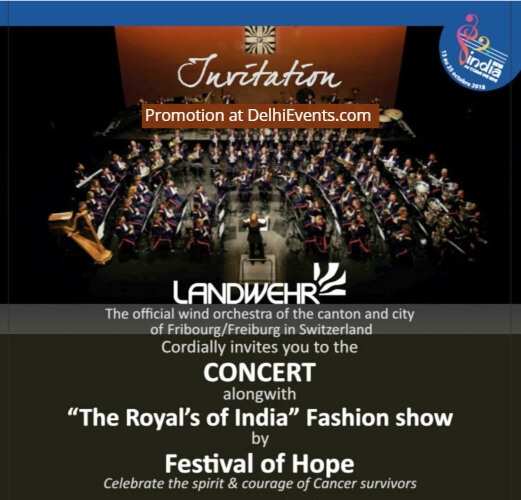 Event Description : MUSIC / FASHION SHOW "Festival of Hope", with Live Performance by Swiss Wind Orchestra Landwehr of Firbourg and a fashion show by Royals of India to celebrate the spirit of cancer survivors. A fund raiser concert for Kerala Flood relief and cancer affected children. This year the foundation is supported by the World famous Swiss Wind Orchestra Landwehr of Firbourg. 80 musicians on stage performing live and a grand fashion show by The Royals of India. FESTIVAL OF HOPE leverages the platform of art, fashion and music to create and spread awareness to prevent and detect early stages of cancer. The Foundation is supported by eminent personalities and achievers from all walks of life, bringing together “Leaders of Hope” who actively contribute by volunteering their time, money, and skills to make a difference.